NulisBuku founding team consists of Ollie (Aulia Halimatussadiah), Angeline Anthony, Brilliant Yotenega and Oka Pratama. With Ollie & Angeline from Kutukutubuku.com on board, and Brilliant Yotenega and Oka Pratama handling the publishing & printing function, the team looks solid to lead the startup to greater height. NulisBuku monetizing strategy is based on royalty. For every books sold, NulisBuku will take a cut. “We are also in for a brand or product campaign, so besides the print-on-demand strategy, we also have a B2B alternative.” said Ollie. 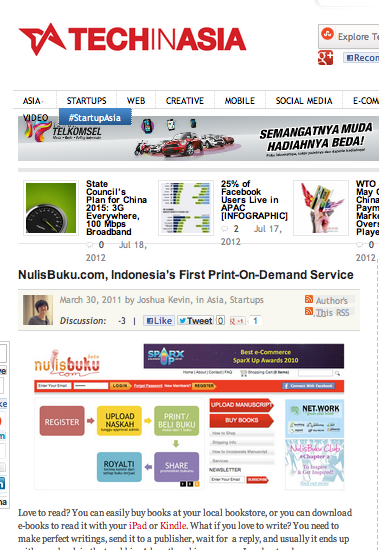 NulisBuku campaign on social media has also taken off with “Low Budget High Impact” as the slogan. It was a great success. “Our influence in social media is great, it gets to the phase where we have evangelists that promote us voluntarily, we also have a writing project that is held routinely.” Ollie added.